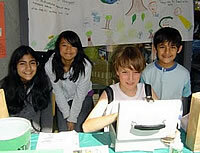 July 2009 – With a little help from Rocky Mountain Flatbread Education facilitators and big funding from Vancity, Responsible Entrepreneurs have been creating environmentally and socially conscious products right here in the elementary schools of Vancouver, BC, and Canmore, AB. Students from grades 2 to 12, have successfully developed, manufactured, packaged, marketed and sold socially and environmentally responsible products to their families and communities. This year in Vancouver, students from Lord Tennyson, Queen Victoria, Queen Elizabeth Annex, Charles Dickens elementary, and R.C. Palmer Secondary school, made some amazing environmentally friendly products. They created green cleaning kits, healthy snack bars, funky belts made from bike inner tubes, beeswax candles, potted plants, beds of lettuce, lavender bags, organic crepes, and much more! 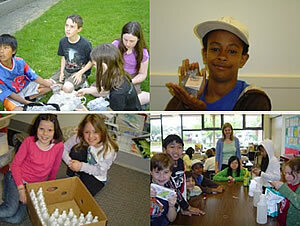 DO YOU have any ideas of responsible businesses that kids could create? Our young responsible entrepreneurs have found ways to turn what we call ‘junk’, into something new; like turning bike inner tubes into fashionable belts, dog collars, and skate guards! They have also created and sold alternatives to unhealthy and environmentally harmful products, like green cleaning products. They love to incorporate what they’ve learned about climate change into their sales, for example, selling stainless steel water bottles to educate their customers on the harmful aspects of plastics on our health and the environment. We look forward to hearing your brilliant ideas!